Welcome, It gives me great pleasure to introduce you to the first issue of The Property Development Review, our new monthly digital magazine designed specifically for property development related professionals. 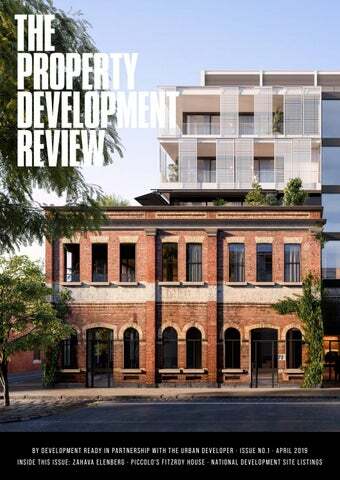 The Property Development Review features the latest and significant development sites for sale as offered by key Real Estate Agencies Australia-wide. In addition, it contains relevant and topical industry news and information. Development Ready have strategically partnered with Australia’s leading property development news platform, The Urban Developer, who will provide a wide range of noteworthy content. Practical as she is philosophical, Zahava Elenberg works collaboratively with developers and architects realising their vision for how a finished space can come to life. Established 17 years ago, the idea for Move-In was conceived almost by accident during her time at Elenberg Fraser, when clients asked the firm to furnish properties for their investors. “It’s not something that I had heard of, something that existed, or something that we did,” she said. “Today every project we do is totally unique and we try and deliver the promise of the architect and the developer’s vision from the outset,” she says. Move-In are currently working with developer Global Student Accommodation (GSA) on a suite of student accommodation projects. events and social engagement, something she plans to launch in her favourite world city, New York. And having known “success” in many forms, the former Telstra Young Businesswoman of the Year believes its definition is being able to implement some kind of change. “I think there’s this very artificial sense of achievement that wealth brings and that’s not what success is to me. “Success is more about contribution, and being part of a continuous narrative that allows for change. The commitment and passion we bring are real. For a confidential discussion about how we can deliver Real Results for your property, contact us today. Real Properties holds an unwavering commitment to helping clients realise the full potential of their investment. Our highly skilled and genuine team of industry professionals have extensive consulting experience in helping global and local clients to develop bespoke, highly strategic and a creative approach to every project. Our services include Commercial, Industrial & Logistics, Property Management, Residential Projects and Site Sales & Investments. outperform official views by $1.2 billion in 2018-19, fading to $0.5 billion in 2019-20. “The house price crash is a problem for the economy, but it’s a nothing burger for the Budget – remember that we don’t tax wealth, and that indirect wealth taxes such as capital gains receive overly generous treatment,” Richardson said. “And although the house price crash will take bites out of the GST take, that downside hits grants to the States. That’s a budgetary bullet dodged.” The downturn in house prices is now expected to have a limited effect on tax collection for the commonwealth, though will likely moderate consumer spending. However, the shift in investment preferences could see household spending slow even further, weakening what is the largest part of the Australian economy and if it slows, the broader economy will almost inevitably slow with it. “The news is otherwise pretty poor, with crashing house prices increasingly weighing on the willingness of families to spend,” Richardson said. “That’s why indirect taxes may fall shy of Treasury forecasts by $0.5 billion in 2018-19, with that shortfall then blowing out to $1.6 billion in 2019-20.” Analysts now expect total spending at a moderate $0.25 billion lower this year than expected by Treasury in the Budget update issued in December. get there if it really wanted,” Richardson said. “On current trajectory we’ll have a surplus next year anyway, the first cash surplus since 2007-08.” AMP Capital economist Shane Oliver highlighted the scope for more fiscal stimulus with extra money flowing into Canberra. “I think that will perhaps be the highlight of this budget,” Oliver said. “The government will likely announce bigger tax cuts starting in July.” “They’ll probably be modest in the great scheme of things, but they will provide some relief for the Australian economy and a bit of support for households.” Prime minister Scott Morrison’s government is currently trailing in opinion polls ahead of a May election and is expected to use the improved fiscal position to try to buy its way back into contention. MAJOR TRANSACTIONS potential for a 12-storey mixed-use facility, was picked up by Gary Dempsey Developments for $5 million; West Australian developer, Devwest employed CBRE for the sale of their neighbourhood shopping centre in Wattle Grove, trading the property to Mair Property Funds for just over $16 million. The biggest hotel deal of the year was struck when European investment giant AXA secured a portfolio of four Accor hotels including Olympic Park and Canberra from the Abu Dhabi Investment Authority for $330.4 million; CBRE were involved in the selling of the final stage of an industrial joint venture project, between Macquarie Group-backed LOGOS and Partners Group, in Yennora for $49 million; A Parramatta office tower has been snapped up by the City of Brisbane Investment Corporation (Brisbane City Councilâ&#x20AC;&#x2122;s future fund) for just over $44 million from previous owners, Hadley Green Investment Group, in an off-market sale handled by Colliers International. A development site in the Brisbane riverfront suburb of St Lucia, sold successfully off-market through Colliers International for $8.5 million to Queensland developer QM Properties, following an unsuccessful settlement in 2017 with Melbourne developer Kokoda Property; A Brisbane office tower, previously owned by private Canadian investor Quadra Pacific, has been traded for $115 million in a joint venture purchase involving US real estate investment management firm Heitman and Marquette Properties. JLL handled the sale. Frasers Property Australia sold the remaining half share of a Southbank office tower to the GPT Wholesale Office Fund (now 100% owners) for just over $326 million. They were supported through the sale by conjunctional agencies JLL and CBRE. A local developer picked up a site, marketed by Colliers International in Fitzroy North, with approved plans and permits for a six-storey apartment complex, for $8.13 million; Ski resorts at Mount Hotham and Falls Creek have sold to New York-listed Vail Resorts on Friday for $174 million, considerably higher than the expected price tag of $120 million. Seller was British-listed Merlin Entertainments. Commercial SA Property Group were responsible for the sale of two adjoining retail properties in Campbelltown, one sold leased and one sold vacant, achieving $1.5 million for the joint sale; An Adelaide CBD development site, marketed by JLL with potential to develop up to 53m with Capital City zoning in the north-west quadrant near Chinatown, was sold for $1.25 million; A residential site in the north-eastern suburb of Tranmere, was marketed by Harcourts Williams with considerable townhouse subdivision potential and sold for $675,000. Houses: In January 2019, the median price of houses fell 3.83% over the previous three months to $1.08 million. This remains, however, a 32.5% increase from the median house price of $815,000 offered in January 2016. Weekly median advertised rent is $600. Units: In January 2019, the median price of units remained fairly flat over the previous three months growing by 1.01% to $500,000. There has been no significant growth in unit prices over the past three years, when the median price reached was $495,050. HO-ST of Brunswick: Aiming to reshape and regenerate Hope Street's old industrial heritage, HO-ST is setting out to create a comfortable and contemporary residential community at 8 Hope Street. The project is currently in construction phase, and upon completion will present 19 residences (mix of one, two and three bedroom) over 5-storeys. 8-14 Michael Street: This eight-storey project has recently received development approval for 72 residences after a contentious preliminary application. Under the Victorian Government’s ‘Agent of Change’ provision, the previous development application was denied due to the potential impact on residents from local music venue, Howler. The new designs by ‘SJB Architects’ have since been accepted by the Moreland Council and include room for 83 bikes and 81 car spaces. Your list of upcoming Auction and Expression of Interest (EOI) closing dates for all major Victorian properties. Click on the link to view the listing in further detail. The site, which has a rich history in the local fabric and was once a boot-makerâ&#x20AC;&#x2122;s shop, will be transformed into contemporary apartments. Image Credit: Piccolo Developments. Despite uncertainty in Melbourne’s residential market, Piccolo has revealed plans for its latest development, confident there is strong demand for quality projects. For Sale by Expressions of Interest closing Wednesday 8 May at 2pm. For Sale by Expressions of Interest closing Wednesday 3 April at 2pm. MingXuan Li 李名轩 Julian Heatherich Mark Stafford mli@savills.com.au jheatherich@savills.com.au mstafford@savills.com.au 0498 688 998 0412 995 655 0404 401 053 *Approx. To discuss how we can generate an extraordinary sale for your property by accessing our vast international platform (Savills has over 25,000 staff in Asia), please contact the Savills Sales Team at any time. –	Located in the City of Wyndham, Riverwalk Town Centre is in the heart of Melbourne's booming western growth corridor. Connecting people & property, perfectly. 356-362 Murray Road, Preston VIC. 13 Lewisham Road, Windsor VIC. 368 Lygon Street, Brunswick East VIC. 35 Herberts Lane, Diamond Creek VIC. Accelerating success Reach more people â&#x20AC;&#x201C; better results faster. Incredible opportunity for motivated property developers (STCA), this former “Southern Motors” building shell is set behind an evocative circa 1920’s brick façade. Boasting corner block approx.1014m², front/rear access and triple street frontage, near trams, hospitals, universities, Errol St precinct and CityLink. An opportunity to secure a prime parcel of land to be sold with Town Planning Plans and Permits for 7 townhouses. The property offers an existing solid brick home on a large parcel of land measuring approximately 847m². Located within close proximity to retail amenity and close to Oak Park and Pascoe Vale train stations (Craigieburn Line to CBD). Ascot Vale. 42 Milton Street With approved plans and a permit for three townhouses in a premium location, this site is a standout. Set just a short walk from Puckle Street, Union Road precincts and Ascot Vale train station. Approved plans for three architecturally designed townhouses are ready to herald in a new chapter for this well positioned development site. As of the 2016 Census, Kangaroo Points reported a total population of 8,063 people; an increase of 15.2% from the 2011 Census. The median age has moved from 35 to 34; with Queensland’s median age at 37 and Australia’s at 38. The number of people per dwelling through this period has remained the same at 1.9. The most significant age brackets exist between the ages of 25 and 34. Almost 40% of residents have achieved a Bachelor Degree or higher and 60.9% of people are working professionals, manager or in administration roles. developments, cafes and restaurants. As such the area has significant appeal for young professionals; just 28.9% of families have children, which is much less than the rest of the state or Australia. The area boasts an abundance of appeal for day visitors and tourists alike, with the heritage-listed Kangaroo Point Cliffs overlooking the city skyline and its proximity to Southbank and multiple highend restaurants. which identifies the impact of the expected population growth on the region’s ability to cope with future transport demand. South-east Queensland is already home to over two-thirds of the state’s population. The region is home to nearly one in every seven Australians. The agreement marks the second city deal for Queensland following the policy being first established in Townsville. So far, city deals have been developed for Western Sydney, Townsville and Launceston, and a further four more are currently under negotiation in Adelaide, Hobart, Perth and Geelong. High Level: The Six 'Game Changers' for the Region. 01. Build on Cross River Rail and Brisbane Metro to move SEQ towards a 45-minute region by delivering the next wave of Rail and Metro projects to connect key activity and growth centres. 02. Supercharge an SEQ Trade and Enterprise Spine between the Toowoomba Trade Gateway and the Australia TradeCoast by connecting Inland Rail to the Port of Brisbane. 03. Ignite Innovation Precincts to deliver more high-value, knowledge-intensive jobs through enabling-infrastructure and a culture of innovation and entrepreneurship. 04. Establish SEQ as Australiaâ&#x20AC;&#x2122;s leading Smart Digital Region by leveraging the new International Broadband Submarine Cable to deliver a Digital Trade Hub and taking a region-wide approach to data and digital connectivity. 05. Deliver better recreational spaces and landscapes for our growing region, including through a new tripartite Liveability Fund to co-invest in critical blue and green infrastructure. 06. Deliver greater coordination and collaboration between federal, state and local governments, including a new tripartite Regional Coordination Board to support strategic governance for the region. If you are considering selling your development site or commercial property either through an onmarket campaign or confidential offmarket approach please be in touch. volliquo mil earis dolento tassequ LESS SEARCHING. iberfer feriorp orepediaeris aute MORE nullessitam DEVELOPING. es ipicia dolo dicabo. much of the land is suited towards agriculture, industrial and commercial outcomes. With the State Government’s Metropolis of Three Cities infrastructure development plan and the establishment of the Badgerys Creek Airport, Kemps Creek’s culture is set to evolve. also house a “limited collection” of 82 private residences. The construction team has reached three building stages: completion of the podium structure which is capped off by two roof-top infinity swimming pools, fitting of the first of the hotel rooms, and installation of the glass facade. Crown Resorts’ Todd Nisbet described Crown Sydney as “one of Australia’s most sophisticated buildings” targeting investment from ultra-high-net-worth individuals. “We are singularly focused on delivering a sustainable luxury development that will stand the test of time,” Nisbet said. Up to 78,000 cubic metres of concrete has now been placed, with 14,000 tonnes of reinforcement, and 3,037 tonnes of structural steel in the podium structure placed to date. Hotel floors start at level six and are now up to level 21. The lift core currently sits at level 29, the current highest point of construction at 120 metres above the water. Exterior glass panel installation has started, totalling over 7000 when complete, and podium exterior glass panels installation is also in progress totalling over 1500 when completed. THE SITE WILL BE SOLD VIA AN INTERNATIONAL EXPRESSIONS OF INTEREST CAMPAIGN CLOSING TUESDAY 2ND APRIL 2019 AT 3.00PM (AEST). Bordered on the south-west by the Canning River and Regional Park, Cannington is a multi-faceted suburb suiting a wide range of lifestyles. While first settled in the 1840s, the suburb didn’t see significant growth until the 1960s and again in the 1990s. Now with an abundance of schools, shopping, parks and public transport options within its 4 square-kilometres, Cannington’s location allows residents an ease of exploring everything Greater-Perth has to offer. Park-life is in abundance, with locals enjoying many nearby options, as well as the winding Canning River. A number of local schools, in and surrounding the neighbourhood, service the area from early learning through to tertiary. Yagan Square, designed by Lyons in collaboration with Iredale Pedersen Hook and Aspect Studios. Image Credit: Peter Bennetts. Connecting people & property, perfectly. 19 Jamaica Lane, Clarkson WA. 192 & 192A Main Street, Osborne Park WA. 305 Corfield Street, Gosnells WA. Lot 15 Milldale Way, Mirrabooka WA. 1 Newmarket Parade, Butler WA. Lot 41 Commonage Road, Dunsborough WA. Between the 2011 and 2016 census’, the median age of Campbelltown rose from 40 to 41-years-old (SA; 40 – AUS; 38). Population itself rose by 7.15% to reach 8,156, and is spread relatively evenly across all five-year age bracket groups from 0-100. Interesting to note, is the disproportionately high number of 75+ year olds, which account for 14.9% of the total; as compared to 8.2% for South Australia and 6.9% for Australia. The suburb truly is a mix of each age demographic. Ellison: Metro Homes SA are bringing nine two-storey dwellings to 51 Church Road. Currently in the registration and sales development stage, each townhouse offers 3-bedrooms and two and a half bathrooms. Aspire: Located on Chamberlain Street in Campbelltown's CBD, Aspire offers 69 modern and well-appointed apartments (a mix of one and two bedrooms) over six levels. Some apartments present stunning views across the city skyline, others offer unique private outdoor courtyards, and some hold dual balconies. Currently in construction, the project is set for completion in mid-2019 and has almost reached 100% pre-sale. Situated 8.7km north-east of the Adelaide CBD, Campbelltown has enjoyed a flurry of residential demand and supply over the past decade. Bordered at the northwest by the River Torrens, local residents enjoy a number of picturesque walking trails, while other parks, playgrounds and outdoor sport courts can be found dotted through-out the area. DLH Projects is close to completing its battery-run housing development in the city's south west. The development will help consumers save money through energy efficient practices. Image Credit: DLH Projects. – Development Plan Consent for a two level medical centre – 90m* frontage to Main North Rd – High exposure location with over 36,000* vehicles passing daily *Approx. PAYNEHAM SOUTH 33 DEVITT AVENUE The solid brick 3 bedroom home currently on the land allows the potential to lease in the short term and develop when you please. Premium location between the city, airport and the sea, Plympton is a highly sought after suburb in the inner south west of Adelaide which sits only 5km from the CBD. 1215-1217 South Road, St Marys SA. 1 Oval Avenue & 4 Edward Street, Woodville South SA. For Sale by EOI closing 11 April at 4pm. According to new research from the Economist Intelligence Unit (EIU), which has explored the top 10 risks the global economy is facing in 2019, "the outlook for the global economy is worsening". With concerns surrounding key economies, including China and the European Union, the EIU has forecast global growth to decelerate from 2.9 per cent in 2018 to 2.8 per cent in 2019 and 2.6 per cent in 2020. Significant vulnerabilities are also apparent in some of the world's largest economies, including sizeable debt burdens in China, the US and Italy, among others and also within emerging markets, which are "highly exposed" to global trade and capital flows. At the top of the threat chart is the rising tension between the US and China, with the trade disputes potentially escalating "into a full-blown global trade war" and China and the US have attempted to resolve the current trade dispute. Earlier this week, the US government announced plans to suspend further increases in tariffs on US$200 billion (AUD$280 billion) worth of Chinese goods. Analysts warned that while this will avoid an escalation in tensions for now, a full-blown trade war between the US and China remains a significant risk to the global economy. currency crises within the two nations. Analysts anticipate that investors could abandon emerging markets across the globe if the recent currency crises in Argentina and Turkey escalate into fullblown banking crises as the rising value of foreign-currency debt leads to defaults. “Market sentiment remains fragile, and pressure on emerging markets as a group could re-emerge if market risk appetite deteriorates further than we currently expect,” the EIU said. Another major threat was in China's shift towards looser macroeconomic policy with a risk that in the government’s efforts to support the economy, policy missteps will be made leading to "a disorderly and prolonged economic downturn". China's stock of domestic credit remains at over 230 per cent of GDP at the end of the third quarter of 2018, signalled as a major vulnerability. Other major threats included supply shortages leading to a globally damaging oil-price spike and the UK's withdrawal from the EU without a finalised agreement triggering a sharp depreciation in the value of the pound and a much sharper economic slowdown across the UK. As Australia faces a federal election this year, The Urban Developer's Adam Di Marco says several policies impacting the housing sector, notably, negative gearing and capital gains tax are up for grabs. “The election battlegrounds of housing and property include negative gearing, public housing, infrastructure and ‘city deals’, banking reform, population and foreign investment,” he said. With news surfacing overnight that China has banned Australian coal exports, Haratsis says it's something to keep an eye on as news develops. So far RBA governor Phillip Lowe has said he doesn't expect the blocking of Australia's coal imports to have a “dramatic effect” on the economy, as it's understood the blocking could span a couple of months. TO RECEIVE THIS MONTHLY MAGAZINE DIRECTLY TO YOUR INBOX, SIGN UP HERE. TO FIND OUT MORE ABOUT THE URBAN DEVELOPER, CLICK HERE. TO FIND MORE DEVELOPMENT OPPORTUNITIES ACROSS THE NATION, CLICK HERE.